Cork is the outer bark of the cork oak tree or Quercus (oak) suber (cork). This remarkable tree has a bark (suberose parenchyma) which is unique throughout the plant kingdom. The cork bark can be harvested from the tree allowing new bark to grow in its place without killing or damaging the trees. This makes every tree a renewable source of raw material. Cork is the outer bark of the cork oak tree or Quercus (oak) suber (cork). This remarkable tree has a bark (suberose parenchyma) which is unique throughout the plant kingdom. The cork bark can be harvested from the tree allowing new bark to grow in its place without killing or damaging the trees. This makes every tree a renewable source of raw material. The cork is harvested (peeled) from each tree time after time. The first harvest of the cork bark occurs approximately 20 years after a sapling is planted. 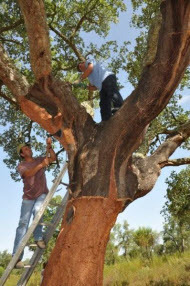 After each harvest the cork tree fully regenerates its bark and is harvested every 9 to 10 years until the tree is about 200 years old. When the aged tree is removed, two new saplings are planted in its place, ensuring the cork forest continues to flourish and expand. The cork oak tree also reproduces off-springs naturally by dropping acorns that seed themselves and mature into productive trees. Cork and the LEED Rating System Cork products contribute extremely favorably to the Leadership in Energy and Environmental Design (LEED) Green Rating System. Cork is a 100% sustainable and renewable natural resource.